^ Long JA, Trinajstic K, Young GC, Senden T (2008). “Live birth in the Devonian period”. Nature 453 (7195): 650-652. ^ Goujet D, Young GC (2004). 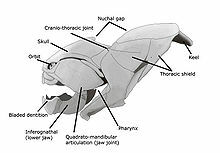 Placoderm anatomy and phylogeny: new insights. In: Recent advances in the origin and early radiation of vertebrates. München: Verlag Dr. Friedrich Pfeil.